New book, 242 pages. 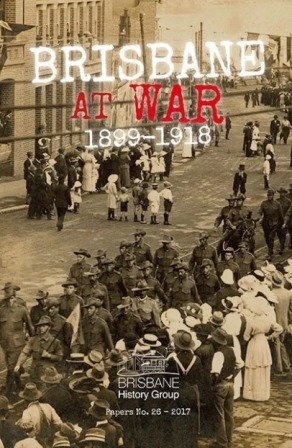 Brisbane at War 1899-1918 is the Brisbane History Group’s twenty-sixth volume of papers. In total there are eleven chapters. All were mostly delivered at BHG functions. Two are from a seminar entitled 'For Queen and Empire: Queensland and the South African War 1899-1902' held on 26 May 2012 and seven were delivered at our seminars 'Brisbane and World War I' held on 6 September 2014 and 3 October 2015. An additional two papers were delivered elsewhere. Written by amateurs, professionals and academics, the chapters offer a diverse range of subjects. Themes include: The importance of military medicine during the Second South African War; the Dutch attitudes and responses to the Boers and British and their decision to adopt a 'neutral' position; the story of the twelve Brisbane Grammar School old boys who fought in the Second South African War and World War I; the increasing activity at the Port of Brisbane as troops embarked for Europe and German raiders ventured into the Pacific; the underage enlistees, their motives, their experiences, their fate and the aftermath; the paediatricians and paediatric nurses who readily volunteered for duty in World War I; the formation of the Women’s Peace Army and its 'war against war' and conscription; the influences on Canon John Garland and his design for the Anzac Day service; the sorry saga of the Clark Memorial Windows at St John’s Cathedral; the response of Brisbane theatre to the changing attitudes of audiences in World War I; the opportunities to display patriotism in a range of different performances.